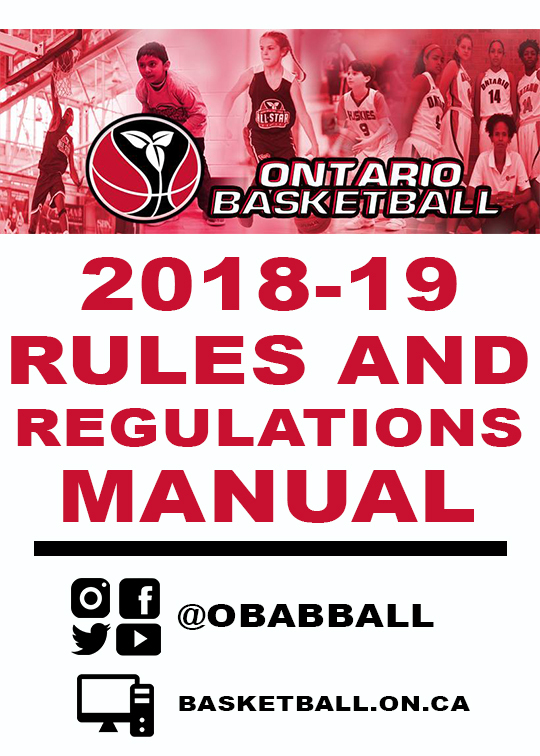 In order for games to be covered under Ontario Basketball (OBA) insurance, a team must be completely registered (including payment of all registration fees) with Ontario Basketball prior to their first game of the season and be in compliance with all insurance conditions. Note: U10 Novice to U12 Major Atom teams that are able to demonstrate that they have made reasonable efforts to recruit 11 players for their OBA team roster but have been unable to do so may request an exemption. For all U10 Novice to U12 Major Atom exhibition, sanctioned tournament, and OBL games, a team must have 10 players to start each game, otherwise the game is forfeit (2-0). In such circumstances, the game must still be played. For all U10 Novice to U12 Major Atom Ontario Basketball Championships, a team must have 10 players to start their first game of the weekend. Teams that have Ontario Scholastic Basketball Association (OSBA) players on their club rosters must declare their registration to Ontario Basketball via e-mail to Mike Barbin. Teams must be wearing a jersey that corresponds to the affiliated member club that they are associated with. Sanctions for both the team and club will occur if violation of this rule occurs. Exhibition games must be reported and sanctioned by Ontario Basketball in order for game results to count for rankings, but more importantly for Ontario Basketball insurance to be valid. The new process to apply for sanctioning will be available on the Ontario Basketball website under Host an Exhibition Game. Teams must post their scores within 14 days following completion of a game. If a game result is not posted within the above timeframe, the score will not be considered by the Ranking Committee. Provincial Championships: 3 guaranteed pool games (1 game Friday and 2 games Saturday). Sunday will have semi-finals crossover to determine teams for bronze and gold medal games. Ontario Cup Championships: 4 guaranteed games (based on an 8-team draw); same format as 2018 Ontario Cup Championships. In previous years, “Young Player Rules” for Learn to Train (U10–U12) teams were included in Section 9: Age-Specific Rules. Other rules of play modifications, like playing person-to-person defense rather than zone defense and not double teaming or pressing, are not rules enforced by game officials or Ontario Basketball. Instead, these rules of play modifications serve as an approach to providing stage-appropriate competition that maximizes each athlete’s long-term development, in alignment with Long-Term Athlete Development literature. As per the Long-Term Athlete Development framework, the focus for Learn to Train athletes is centered on the development of fundamental movement skills (physical literacy), sport-specific fundamentals (layups/shooting, passing, dribbling), and developing the physical capacity for and understanding of basic offensive and defensive principles to lay the foundation for success in later developmental stages. A focus on adult game tactics during practices and competitions (e.g., offensive isolations, zone defenses, full-court pressing, etc.) is counter to athlete development when they limit the time spent developing young athletes’ fundamental skills. For example, using full court pressure against 10-year-old athletes who are just being introduced to the game is exploiting the young athletes’ lack of skill with a game tactic for the purposes of winning, often at the detriment of skill development (e.g., an opportunity for young athletes to practice critical skills in the offensive half-court). It is the responsibility of club executives and coaches to ensure they understand the developmental focus for the stage of athlete they are coaching.